Schooner Ridge is a community of 94 single family lots in the heart of Duck, North Carolina. The community has some of the most extensive amenities of any community in Duck which are enjoyed by owners and their guests all year round. There is a recreation center with indoor pool, a wide variety of workout equipment, a video game room and uniquely enough–a racquetball court. Outside the recreation center is a second pool, two tennis courts and playground equipment. 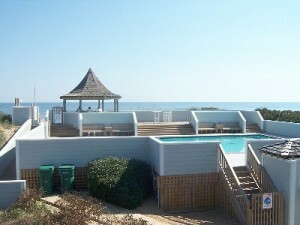 At the community oceanfront access is a third pool, one of the very few in the area to be situated right on the oceanfront. The high elevations offer sweeping views from traditional seaside homes.